Dental Insurance, it is the best it is the worst. This sounds like the start of a Charles Dickens novel, but it is the truth. We have all been down the old road before where we pay a bunch of money for insurance, then find out we weren’t covered when we needed it. When this happens we feel cheated, leaving us with more questions then answers. Here are a few of the common dental insurance questions, which your carrier and HR representative should be answering. What about insurance networks? It seems you need some sort of Phd in insurance to figure out who is in what network and if going in network even matters. Because, truthfully, sometimes it does matter and sometimes it doesn’t. Why in the world are somethings covered and some not? It is so confusing. Why at the dentist are somethings covered at different percentages? Who sets these amounts and why? What rhyme or reason does this all have? It is so confusing and frustrating, and seems to have gotten more so in recent years. How can anyone ever negotiate this maze of bureaucratic mess? Does this sound familiar? Read on and let us explain. What Is The Difference In Medical And Dental Insurance? Medical insurance works by these basic parameters in most policies. You have a deductible, you pay your deductible when you have a procedure. The deductible doesn’t apply to things like “well visits” and medications. Mostly the deductible applies to procedures. A normal deductible can range greatly, from $500 to $10,000. Then you have an out of pocket max. Once the out of pocket max is reached, you pay no more for the rest of the year. This works well in case of catastrophic events. Dental insurance is very different than medical insurance. Dental insurance works by these basic parameters in most policies. You have a deductible; you pay your deductible when you have a procedure. Typically the deductible doesn’t apply to things like, cleanings, exams, or x-rays. The deductible is paid when you need to have a procedure such as a filling, crown, or denture, etc. A normal deductible in dentistry is $50 to $150, compared to a medical deductible it is very low. Then you have a yearly max, this is NOT an out of pocket max, but a max that the insurance company will pay toward your dental care in a year. There is less risk to the insurance company with dental insurance because they have capped there risk with this max. Once you have reached this max, the insurance will pay no more. A normal yearly max on dental benefits is $500 to $2500. All dental services rendered count toward this max yearly benefit. Even cleanings and x-rays count against the yearly max. Dental insurance has another unique to dental insurance feature. It is the percentages. What does this mean? Generally speaking most dental insurance companies pay benefits based on what they term Major, Basic, Preventative. Each one of these categories pays differently. They will pay a percentage of the bill and the remainder of the bill is the responsibility of the patient. So you want the percentage of coverage to be as high as possible leaving less balance you have to pay out of pocket. The average person has no idea what falls under what category. How would they know? Here is the typical breakdown of dental benefit categories. Major– Usually covered at 50%- Which means the insured (patient) pays the other 50%- Most of the time crowns, bridges, dentures, partials, inlays, onlays, etc are considered major. Basic– Usually covered at 80%- Which means the insured (patient) pays the other 20%- Most of the time fillings, extractions, periodontal services, root canals, core build up, quadrant scaling, scaling and root planing, etc are considered basic. Preventative– Usually covered at 100%- Which means the insured (patient) pays nothing additional- Most of the time routine cleanings, radiographs (x-rays), exams, dental sealants etc are considered preventative. There are usually timing limitations to the cleanings and sealants, these are different on almost every policy. Now that you understand the basics of how dental coverage works let’s talk about the types of dental insurance plans. Plans are another area that can be totally confusing and can change each time you renew your health insurance if your dental insurance is part of that plan. It can change yearly, and this can determine how much out of pocket you pay. Traditional Indemnity Plan– This is what most of us think of when we think of dental insurance. Most people in Chattanooga have this type of insurance. It has a yearly max as we discussed above. With the normal breakdown of benefits (Major 50%, Basic 80%, Preventative 100%) being very common. Once the max is reached it pays no more, again a normal max is $500-2500. Usually it runs on a calendar year, meaning you get new benefit maximum in January. These are ballpark guidelines; of course every plan has minor changes that makes it unique. Preferred Provider Network (PPO)– This plan functions like a traditional indemnity plan listed above with one exception. They have a network of dentists you can go to and your portion may be less. However, just because there is a network it doesn’t mean it won’t pay the same benefit outside the network. This is getting clear as mud I know. In Chattanooga if you have a PPO through Blue Cross Blue Shield, Delta Dental or Cigna you probably can find a network dentist and save some money. If it is through another smaller company, or if your employer is small, you may be able to go anywhere and receive the same benefit. The best thing to do is call your insurance company and ask specific questions. Ask if there are dentists in network, who they are, where they are located, and if there is a discount to you for using in network dentists? These plans only really work for large employers or networks, because the dentist is agreeing to a lower fee in return for a referral of a bulk of patients. They work for the insurance company because they get to sell the discount at the dental office as a product which they are providing. Direct Reimbursement Plan– This plan is not as common as the other plans listed above. In Chattanooga the biggest group that has one of these is the Hamilton County Schools. This is a neat plan in that it pays usually the most of any of the plans and gives the patient the most choice of dentists and deciding upon their own priorities in their treatment. The only set back is you have to pay up front and as the name implies. They send you a reimbursement check to the patient. I am told by school teachers that their reimbursement check usually arrives in their home mailbox in about one week. They have a benefit break down of major, basic, and preventative as well. Fee Schedule Plan– This plan sets a fee schedule that it will pay no matter who the patient goes to. It says “X” service is paid “Y” amount. After the amount they will pay, the patient is responsible for the balance. Workers Compensation– This usually comes into play when there has been a workplace accident that resulted in a dental injury. Happily we don’t see this all that often, as most work place injuries don’t involve the mouth. When we do see it, it needs to be dealt with a little differently. A treatment plan always needs to be pre-approved by the workers compensation company. It has been our experience most workers compensation cases are where the worker get hit in the face and damages their front teeth. The insurance company wants to be careful they are not paying for cosmetic dentistry that is elective. This is understandable. When we deal with this, we make sure we take photographs of even the simplest procedure to document what is damaged and how the damage was done. It takes some time but in the end it is usually covered 100%. Other plans HMO, CAP, DMSO – We don’t see many of these in Chattanooga, Tennessee. We won’t spend much time on these. There is usually a very small network of dentists and the patient can choose or be assigned to a dentist by the insurance company. The plan pays the dentist a small amount whether you go to the dentist or not. It will pay nothing to any other dentist. In our area there aren’t many of these plans and no major employers have these plans. So if you have one of these call you plan for directions on how to use and obtain your benefits. These plans can be less expensive then other insurance plans. Non Insurance Help – We are not accountants and can’t give you specific advice on things related to taxes. There are ways to save money and pay for medical and dental expenses with pre-tax money. Health Savings Accounts (HSAs) are a great way to help save money. You can put away money into an HSA and then take it out to pay for medical and dental expenses. These expenses can even be elective things. Your employer or your accountant can help set this up for you and even take money out of your check and put it into these accounts. Once in this account, the money may only be used for medical and dental expenses. Here are a few tips for trying to figure out what your insurance will pay and how to pay the least out of pocket. Pay attention when you are buying the insurance. If you are at work and they are offering multiple plans, spend some time really researching which plan is best for your family. If you really only have cleanings and maybe a filling a lesser price plan may be sufficient. If you are wanting to replace a missing tooth you may want a more expensive plan that pays more and is less likely to exclude services. Call your insurance company and ask questions. Remember you are paying them, ask them questions try to understand your plan. They should work for you. Read the booklet they give you and look for a list of dental providers, if you have a PPO. It is ultimately your responsibility to know how your plan works. Do your homework- read the book. Ask our front desk insurance specialist to help you know what your benefits are. We are very good at finding your break down of dental benefits. When you come in bring your card and let us give you a hand. We deal with dental insurance every day and will be happy to help you. Pre-determination or a Pre D. This is where we send in a claim and basically say “If we were to do this “X procedure” what would you pay?”. The insurance will send an answer in about 3 weeks that says, if you do that then we will pay this “Y amount”. It is a great way to know upfront what financial obligation you are facing. We are happy to send these in and help you understand them. Get a treatment plan. We give every patient of ours a treatment plan. If a patient needs a procedure we put this into our computer and based on the break down of benefits we got from their insurance we provide a treatment plan. This says “based on what your insurance told us your benefits are, this is what they should pay and this is what you should owe”. It is a great way to find out what you should end up owing if you have a procedure done. Even if you are not a patient of McOmie Family Dentistry you should request one of these from any dentist. If they won’t provide you a treatment plan you shouldn’t have the work done. Do the math! Call your dentists office and ask “How much did we spend total aside from insurance last year?” If this amount is less then your premium maybe you should just pay out of pocket or utilize a HSA (health savings account). It really doesn’t make sense to pay more for insurance then they give in benefit year after year. That is what they are hoping will happen. It is how they make money. Do the math; it will help you make the right decision. Utilize your HR department. Your works Human Resources office is there to help you make decisions on what insurance is right for you and they can best advise you on how your particular plan works. They will know things like if you have a network of dental offices you must use. They can help decide which dental insurance plan suits your needs. They are paid by your employer to help you, so let help you. Why not? 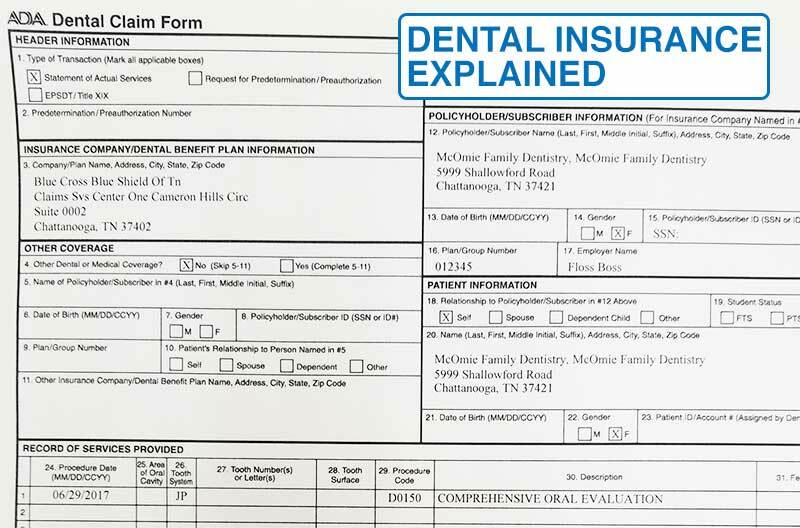 Dental Insurance can be a really hard to understand and hard to deal with. Take a little time in the beginning to make sure you understand your benefits. Talk to others with your same insurance at work, talk to your human resource manager as well. By trying to get some knowledge you will become a better informed consumer. Of course we are here to help you. While we can’t guarantee what the insurance tells us is 100% correct all the time, we have dealt with thousands of dental insurance companies and patient’s benefits. We have learned a few things along the way and we will do everything to help obtain benefits. Dr. Mark and Dr. Ellen routinely write letters to insurance companies to help get benefits. We will appeal denied claims for you and our doctors will write letters to detail why the treatment was necessary. We work hard to help you get the benefits you deserve. If you have any questions about the above information, give us a call at McOmie Family Dentistry 423-899-1112. The above information is just to help gain some understanding in a general sense. It is an outline of insurance in general. This is not about any one insurance company or person, nor is anything listed above meant to be legal counsel. We love our patients: our patients are what make us work hard and enjoy our work! Thanks for reading. Comment below or on our Facebook page. We would love to answer your questions.